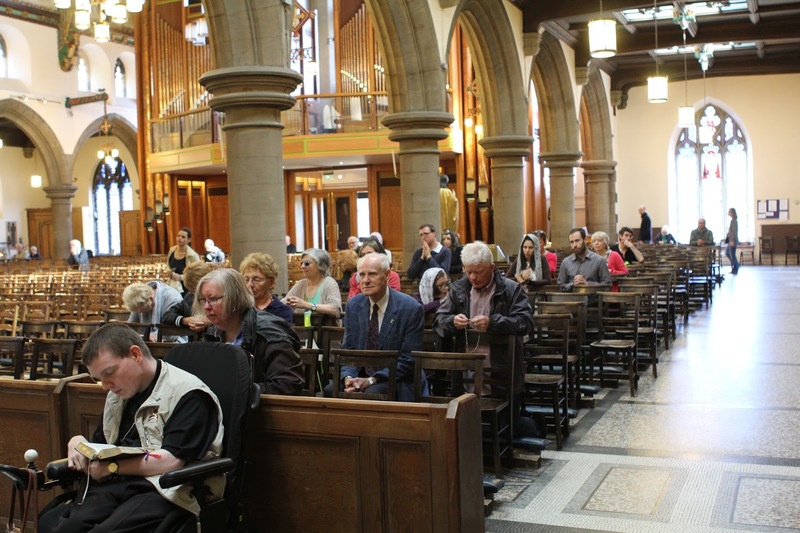 Our thanks to Mr Mark Hamid, the director of the newly instituted Two Shrines Pilgrimage, for sending us this description of what will hopefully become a regular and flourishing part of the Church’s devotional life in Scotland, and to Mr Martin Gardner for the use of his photographs. Those are interested can contact the organizers about attending or supporting the pilgrimage at the following e-mail address: the2shrines@gmail.com. You can also visit their Facebook page. 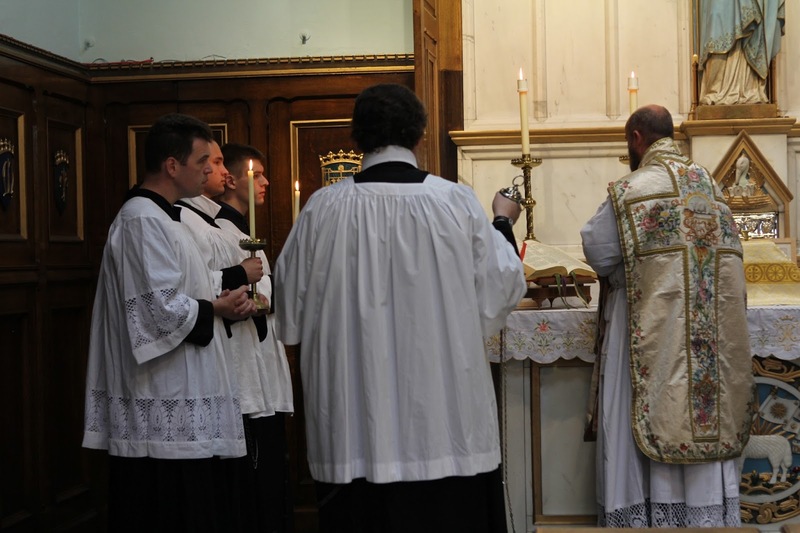 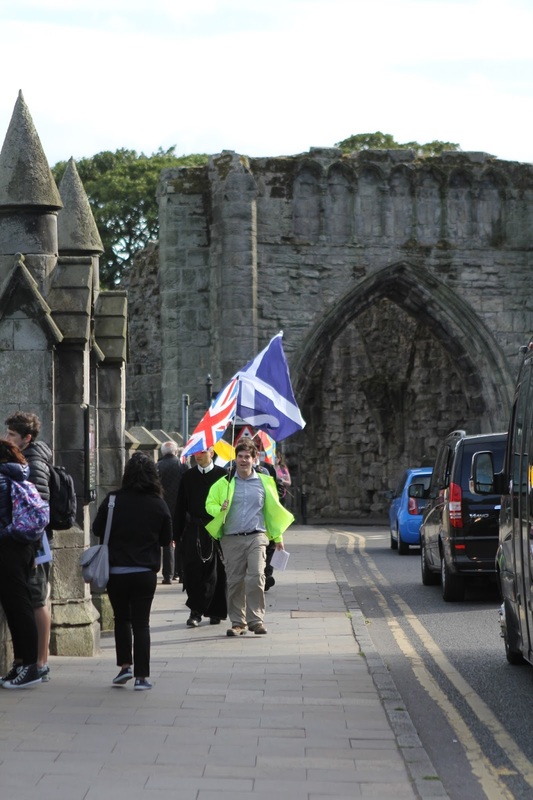 Scotland’s inaugural Two Shrines Pilgrimage took place this month from August 6-8. The walk, which began at the National Shrine of St Andrew in St Mary’s Cathedral, Edinburgh, and concluded at the site of the pre-Reformation shrine to Scotland’s patron in St Andrew’s Cathedral, St Andrews, was undertaken for the particular intention of the conversion of Scotland. 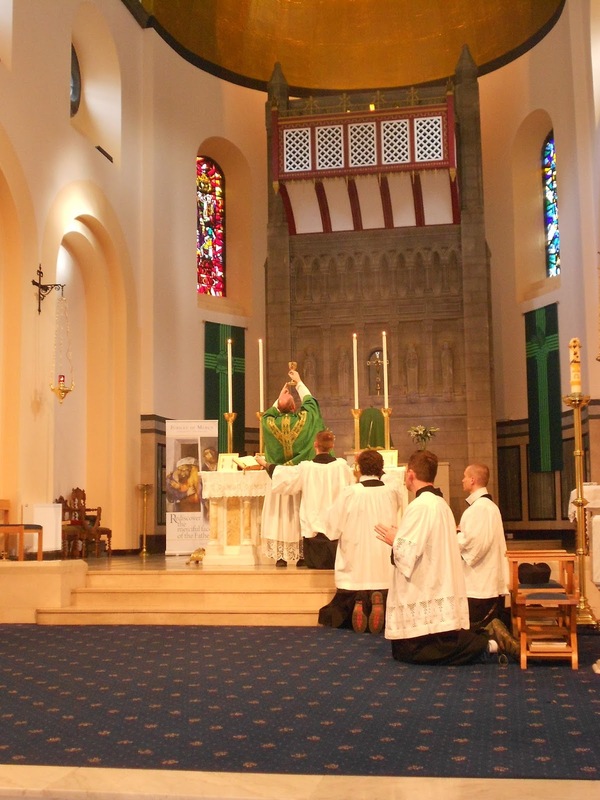 Inspired by the Chartres Pilgrimage, the event incorporated daily Mass in the Extraordinary Form, accompanied by traditional devotions. The pilgrimage began with a Missa Cantata celebrated at the Lady Altar in St Mary’s Cathedral by the chaplain to the pilgrimage, Fr Anthony Mary of the Transalpine Redemptorists. 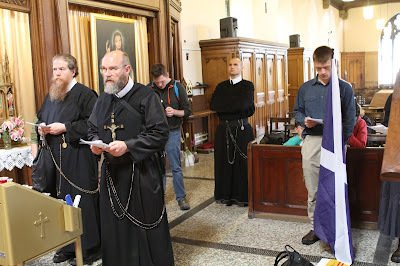 Fr Anthony Mary is the chaplain of the Latin Mass Chaplaincy in Christchurch, New Zealand, but joined the pilgrimage from his regular (northern) summer visit to the Transalpine Redemptorists’ principal community on the island of Papa Stronsay, Orkney, accompanied by two of his brethren. 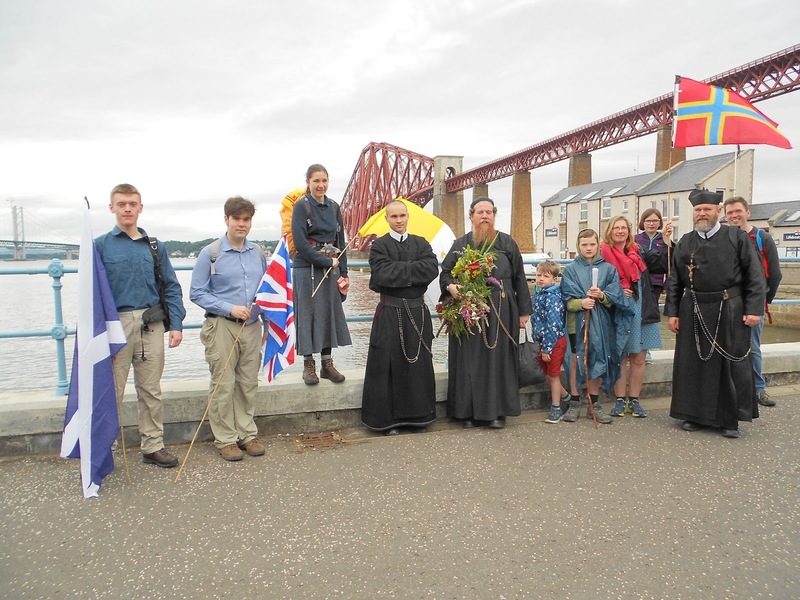 After the traditional blessing for pilgrims was given at the shrine, the chapter headed out of Edinburgh towards South Queensferry to cross the Firth of Forth; this is now possible using the Forth Road Bridge, but in mediaeval times pilgrims used a ferry endowed in the twelfth-century by Scotland’s queen St Margaret, secondary patron of the nation and a particular focus of the first day of the pilgrimage. The pilgrims then walked into Dunfermline, St Margaret’s town, where they received a blessing with her relic before taking dinner and retiring for the evening. 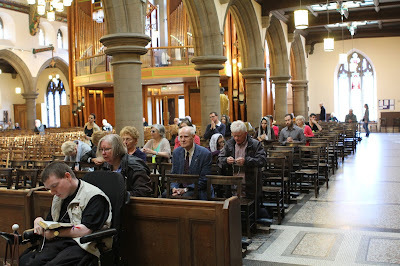 The second day, the Twelfth Sunday after Pentecost, began with a Missa Cantata celebrated in St Margaret’s Church, after which, the pilgrims walked through south Fife, a former mining area, before arriving at Scotlandwell, notable for its holy well which was itself a former site of pilgrimage. The pilgrims then ascended the Bishop’s Hill, in spite of extremely high winds, before crossing the Lomond Hills to arrive at Falkland for the evening. There a Holy Hour in support of the pilgrimage had taken place in the Chapel Royal of Falkland Palace, led by Bishop Stephen Robson of Dunkeld. 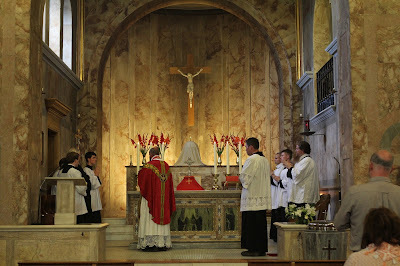 The palace chapel is the only Catholic Chapel Royal in Scotland, and probably the only one in the Commonwealth. 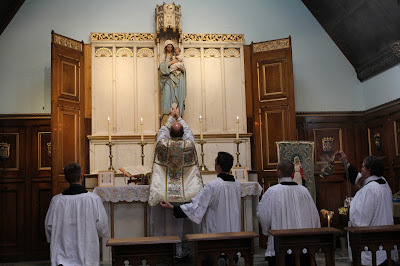 This unusual situation arose through the keepership of the palace by the Crichton-Stuart family, at one point lead by the enthusiastic John, 3rd Marquess of Bute, who was a generous benefactor to the Catholic Church in Scotland in the latter part of the nineteenth century. 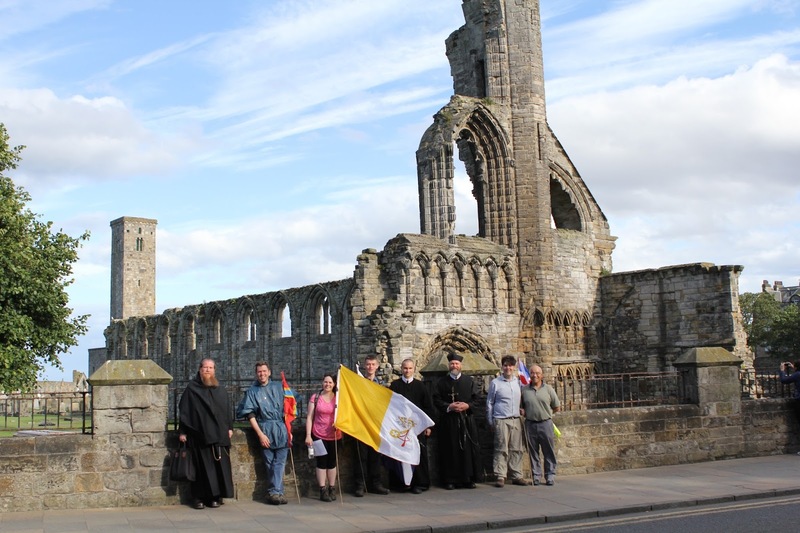 Indeed, it was his wish that the cathedral in St Andrews be brought back into Catholic ownership and restored to its former glory but, alas, this never came to fruition. 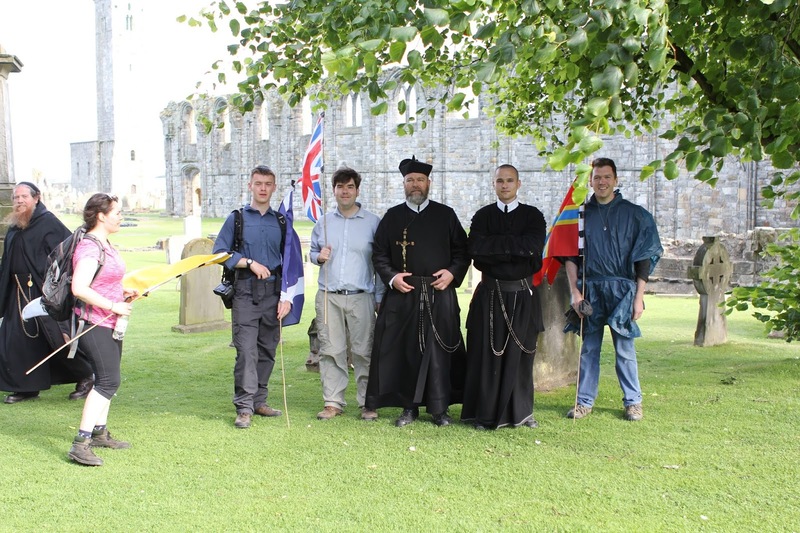 On the final day of the pilgrimage the pilgrims set out from Falkland for St Andrews, the route being generally flat and along quiet country roads through the picturesque Howe of Fife, course of the River Eden. The chapter arrived at the cathedral just in time to make a brief visit to the ruin before closing and processed, singing the Te Deum, to the town’s parish church, St James’, for a final Missa Cantata, a votive Mass of St Andrew. 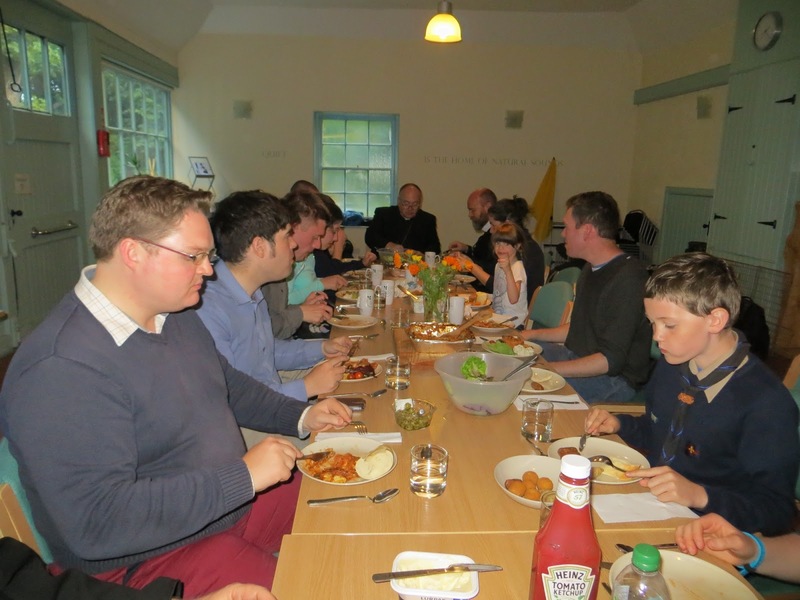 Thereafter, dinner was served in the church hall, providing an opportunity for pilgrims and supporters alike to relax and enjoy fellowship before dispersing. 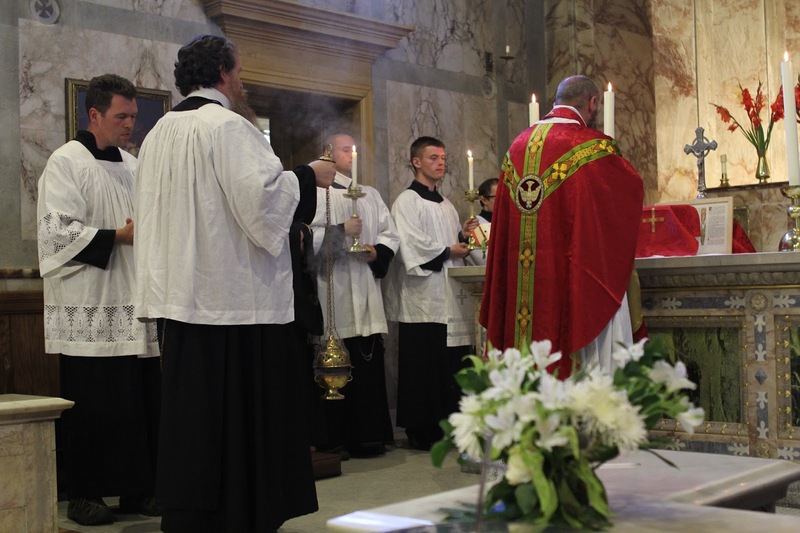 There is already great enthusiasm for our second Two Shrines Pilgrimage, which will hopefully take place once again over the first weekend of August 2017. Anyone interested in attending or supporting the pilgrimage can contact the organisers through the dedicated e-mail address: the2shrines@gmail.com.